The ATH-MSR7NC headphones combine the Hi-Res Audio technology and design features from the original ATH-MSR7 with newly developed active-noise cancelling technology to bring you the ultimate listening experience. 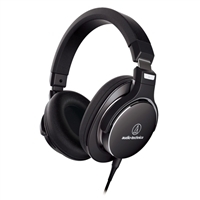 These headphones are outfitted with exclusive 45 mm True Motion Drivers to deliver distortion-free audio reproduction with extended frequency response. A miniature microphone is incorporated into the top of each earcup to pick up ambient noise that can then be blocked by an appropriate sound-cancelling signal when the active noise-cancelling function is activated.